If you are a legal nurse consultant helping attorneys with medical malpractice cases, you will see nursing errors that result in medication errors. Pat discusses medication errors in this podcast. I have a one-hour audio training called Killer Cure. Listen in as I interview Elizabeth Bewley, a safety expert as she exposes the sources of errors in the healthcare system. Health care kills more than 600,000 people every year, the equivalent of the population of Boston. Elizabeth defines our hidden assumptions about health care, medications, and treatments and why these assumptions put you in danger. Elizabeth L. Bewley is President & CEO of Pario Health Institute and the author of Killer Cure: Why Health Care is the Second Leading Cause of Death in America And How to Ensure That It’s Not Yours. She was an executive with Johnson & Johnson for 20 years. She became interested in patient safety after she had personal experiences with health care that almost led to her death. Order this audio training at http://LNC.tips/KillerCure and use the coupon code listened to get a 25% discount on the price. Pat Iyer has been a legal nurse consultant since 1987 when she first began reviewing cases as an expert witness. 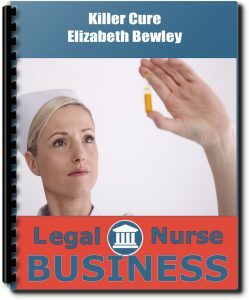 She achieved national prominence through her texts and many contributions to the legal nurse consulting field. She has reviewed several cases involving medication errors.